It's 5:30 A.M. as eight guests of the David Ranch in Pinedale, Wyoming, drag themselves out of bed. Today, they'll find out what they're really made of as they attend the "cowboy school of hard knocks," complete with more swearing, cursing, and "G.D.'s" than you can shake a stick at. But in the end, they'll think they've died and gone to cowboy heaven. An unlikely bunch, decked out in just-worn-in western riding boots, plaid western shirts, and new Stetson hats, they're ready to fulfill their lifelong dream. Each has chosen this adventure vacation because of something inside. This isn't a dude ranch. No siree. Guests pay to work here-- something they'd never do back home. Cowboys in the Wind River Mountains don't wear 20-gallon hats and have silver hanging from their saddles like in the movies. They drive beat-up trucks and about the only thing in shape is their gear. Heaven knows, most of them aren't. Cow punching takes stamina, patience, and more than anything--guts. "Out here, guests work with crude cowboys that don't have the sophistication of city folk," says Melvin David, ranch owner. "For those who can take it, it's one of the best adventures. I take pride in taking a bunch of greenhorns and making them into cowboys in a week." 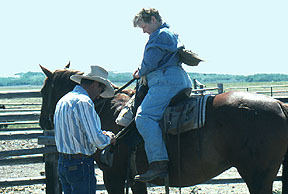 After a hearty ranch breakfast, Melvin takes his greenhorns to meet Robby Moore, his head cowboy, who will teach them everything from brushing their horses before putting on the saddle and bridle to taking care of them after a long day. The dust is thick, the air clear, the sun hot. Robby shows them how to control their horses. David owns about 35 head of quarter horses. "Our horses are exceptional," he says. "We don't do trail riding, except to go to our overnight camp in the mountains. These horses know how to work, cut calves, turn fast. I'm surprised at how many guests haven't ridden before." Surrounded by mountain ranges, the David Ranch seems like it's on the frontier. Guests begin arriving the last weekend in May; the last ones depart the first weekend in October. Usually, the David's host ten per week. After a long day on the range, the newly indoctrinated cowboys and cowgirls head back to the ranch house for a hearty western cookout followed by a game of horseshoes. Tomorrow's just another day on the range for them.